Cameron: 'The choice is in your hands' Jump to media player The UK's referendum on its membership of the EU will take place on 23 June, the prime minister has confirmed. Key points of Cameron's EU deal Jump to media player David Cameron says the EU reform deal has "delivered on the commitments" he made at the start of the process. Gove 'has wanted to leave EU for decades' Jump to media player Justice Secretary Michael Gove had "for many decades" wanted to leave the EU, Chancellor George Osborne has told the Today programme. The UK in the EU: For and against Jump to media player UKIP's Suzanne Evans and Labour MP Alan Johnson set out their opposing views on the UK's membership of the EU for the Victoria Derbyshire programme. Cameron's EU deal made simple Jump to media player The BBC's Norman Smith explains the main points of David Cameron's renegotiation of the terms of Britain’s EU membership. Europe: Why the love-hate relationship? Jump to media player With a referendum on whether Britain should leave the EU looming ever closer, Rob Watson explains the UK's historically complicated relationship with Europe. The EU: All you need to know Jump to media player The BBC's Jonny Dymond explains how the European Union works in under two minutes. The town that held its own 'referendum' Jump to media player The BBC's John Maguire reports from Corby, where an unofficial referendum on the UK's membership of the EU was held over a year ago. Could Brexit bring new powers to Holyrood? Jump to media player An expert in the EU says a vote for Brexit could see major new powers coming to Holyrood from Brussels. What is in David Cameron's EU deal? Jump to media player The BBC's James Landale reports on the deal UK Prime Minister David Cameron has struck on the EU. The UK's referendum on its membership of the EU will take place on 23 June, the prime minister has confirmed. 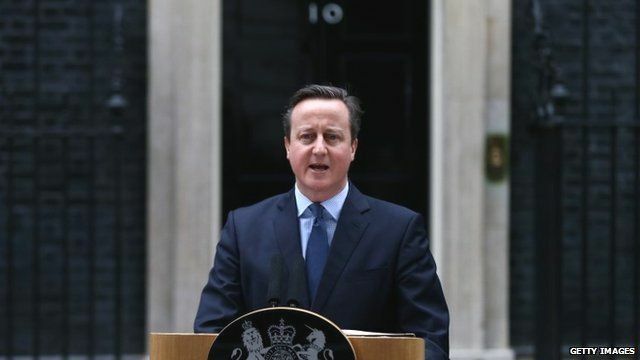 David Cameron announced the date from Downing Street, after a cabinet meeting following his talks in Brussels.